Like tornadoes, typhoons and hurricanes happen when warm air mixes with cold air, creating intense wind, rain and flooding. Typhoons and hurricanes are the same type of storm, but they happen in different places. Typhoons occur in the Pacific Ocean around Hawaii and Asia. Hurricanes occur on the eastern seaboard along the United States and Central America. 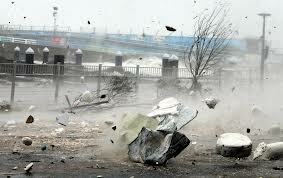 Typhoons and hurricanes happen when warm air mixes with cold air, creating intense wind, rain and flooding. Hurricanes can be up to 600 miles wide. They move slowly over the ocean, gaining power and speed. When they hit land, they can cause flooding and destroy buildings and cars. 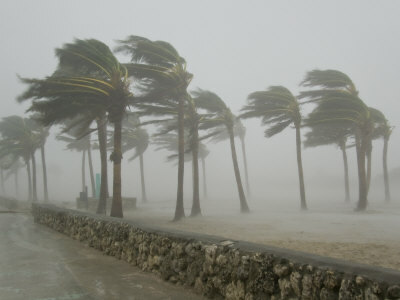 Hurricane winds can blow up to 200 miles per hour. In the center of a hurricane is the eye of the storm. In this area, the weather is calm. Hurricanes can last more than a week, making them very destructive. When hurricanes hit land, they can cause flooding and destroy buildings and cars. A video all about typhoons and hurricanes and how they work. Question: What should I do in case a Typhoon or a Hurricane will hit my area? Answer: Leave the area if you can. If not, board up your home and stock up on supplies like water, food, pet supplies, batteries, gas and money. After a hurricane, people often go for many days without water, food or electricity. Enjoyed the Easy Science for Kids Website all about Typhoons and Hurricanes info? Take the FREE & fun Typhoons and Hurricanes quiz and download FREE Typhoons and Hurricanes worksheet for kids. For lengthy info click here. Declan, Tobin. " Hurricane and Typhoon Facts for Kids ." Easy Science for Kids, Apr 2019. Web. 18 Apr 2019. < https://easyscienceforkids.com/all-about-typhoons-and-hurricanes/ >.